In 1939 Jan Karski was a brilliant young student enjoying a life of parties and pleasure. Then war broke out and his gilded world was destroyed. Recruited into the Polish underground resistance, he was entrusted with a clandestine mission that would endanger his own life in order to try and save millions. 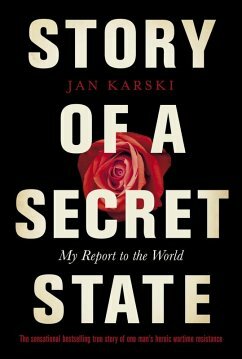 Story of a Secret State is his extraordinary account of what happened. Karski was his nom de guerre; he had been born Jan Kozielewski, the youngest of eight children, in Lodz, Poland's second-largest city, on April 24, 1914. Karski was a liaison officer of the Polish underground, who infiltrated both the Warsaw Ghetto and a German concentration camp and then carried the first eyewitness accounts of the Holocaust to a mostly disbelieving Anthony Eden and Franklin Roosevelt.